The Air Mail scandal, also known as the Air Mail fiasco, is the name that the American press gave to the political scandal resulting from a 1934 congressional investigation of the awarding of contracts to certain airlines to carry airmail and to the use of the U.S. Army Air Corps to fly the mail. In 1930, during the administration of President Herbert Hoover, Congress passed the Air Mail Act of 1930. Using its provisions, Postmaster General Walter Folger Brown held a meeting with the executives of the top airlines, later dubbed the "Spoils Conference", in which the airlines effectively divided among themselves the air mail routes. Acting on those agreements, Brown awarded contracts to the participants through a process that effectively prevented smaller carriers from bidding, resulting in a Senate investigation. The Senate investigation resulted in a citation of Contempt of Congress against William P. MacCracken, Jr., on February 5, 1934, the only action taken against any former Hoover administration official for the scandal. Two days later Roosevelt cancelled all existing air mail contracts with the airlines and ordered the Air Corps to deliver the mail until new contracts could be let. The Air Corps was ill-prepared to conduct a mail operation, particularly at night, and from its outset on February 19 encountered severe winter weather. The Army Air Corps Mail Operation suffered numerous crashes and the deaths of 13 airmen, causing severe public criticism of the Roosevelt Administration. Temporary contracts were put into effect on May 8 by the new postmaster general, James A. Farley, in a manner nearly identical to that of the "Spoils Conference" that started the scandal. Service was completely restored to the airlines by June 1, 1934. On June 12 Congress passed a new Air Mail Act cancelling the provisions of the 1930 law and enacting punitive measures against executives who were a part of the Spoils Conferences. Although a public relations nightmare for the administrations of both presidents, the scandal resulted in the restructuring of the airline industry, leading to technological improvements and a new emphasis on passenger operations, and the modernization of the Air Corps. 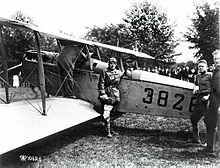 Major Ruben H. Fleet beside s/n 38262 after delivering it to Washington, D.C., for the first airmail flight. Air mail operations by the U.S. Post Office began in August 1918 under Lipsner, who resigned from the Army on July 13 to take the post. Lipsner procured Standard JR-1B biplanes specially modified to carry the mail with twice the range of the military mailplanes, the first civil aircraft built to U.S. government specifications. For nine years, using mostly war-surplus de Havilland DH.4 biplanes, the Post Office built and flew a nationwide network. In the beginning the work was extremely dangerous; of the initial 40 pilots, three died in crashes in 1919 and nine more in 1920. It was 1922 before an entire year ensued without a fatal crash. As safety and capability grew, daytime-only operations gave way to flying at night, assisted by airway beacons and lighted emergency landing fields. Regular transcontinental air mail delivery began in 1924. In 1925, to encourage commercial aviation, the Kelly Act (also known as the Air Mail Act of 1925) authorized the Post Office Department to contract with private airlines for feeder routes into the main transcontinental system. The first commercial air mail flight was on the 487-mile (784 km) route CAM (Contract Air Mail) No. 5 from Pasco, Washington, to Elko, Nevada, on April 6, 1926. By 1927 the transition had been completed to entirely commercial transport of mail, and by 1929 45 airlines were involved in mail delivery at a cost per mile of $1.10. Most were small, under-capitalized companies flying short routes and old equipment. William P. MacCracken, Jr. became the first federal regulator of commercial aviation when then-Secretary of Commerce Herbert Hoover named him the first Assistant Secretary of Commerce for Aeronautics in 1926. During World War I he had served as a flight instructor, had served on the Chicago Aeronautical Commission, and was a member of the board of governors of the National Aeronautical Association when selected by Hoover. MacCracken left the Commerce Department in 1929 and returned to his private law practice, where he continued to be involved in the growth of commercial aviation by representing many major airlines. Postmaster General Walter Folger Brown sought to improve the efficiency of the air mail carriers in furtherance of a national transportation plan. Requiring an informed intermediary, Brown asked MacCracken to preside over what was later scandalized as the Spoils Conferences, to work out an agreement between the carriers and the Post office to consolidate air mail routes into transcontinental networks operated by the best-equipped and financially stable companies. This relationship left both exposed to charges of favoritism. When MacCracken refused later to testify before the Senate, he was found in contempt of Congress. Hoover appointed Brown as postmaster general in 1929. In 1930, with the nation's airlines apparently headed for extinction in the face of a severe economic downturn and citing inefficient, expensive subsidized air mail delivery, Brown requested supplementary legislation to the 1925 act granting him authority to change postal policy. The Air Mail Act of 1930, passed on April 29 and known as the McNary-Watres Act after its chief sponsors, Sen. Charles L. McNary of Oregon and Rep. Laurence H. Watres of Pennsylvania, authorized the postmaster general to enter into longer-term airmail contracts with rates based on space or volume, rather than weight. The Act gave Brown strong authority (some argued almost dictatorial powers) over the nationwide air transportation system. Within days of its passage, United Aircraft and Transport Company (UATC) acquired the controlling interest of National Air Transport after a brisk but brief struggle between UATC and Clement M. Keys of NAT. The merger, begun in February 1930 to plug the only gap in UATC's cross-country network of airlines, had been amicable until three weeks before its finalization, when Keys reversed his initial approval. Ironically Brown was angered by the negotiations, worried that the specter of a potential monopoly would endanger the imminent passage of the Air Mail Act. The merger swiftly created the first transcontinental airline. On May 19, three weeks after the passage of McNary-Watres, Brown invoked at the first of the "Spoils Conferences" his authority under the third provision to consolidate the air mail routes to only three major companies independently competing with each other, with the goal of forcing the plethora of small, inefficient carriers to merge with the larger. Further meetings between the larger carriers, presided over by McCracken, continued into June that often developed into harsh wrangling over route distribution proposals and consequent animosity towards Brown. After what was described as a "shotgun marriage" between Transcontinental Air Transport and Western Air Express in July to achieve the second of the three companies (UATC was the first), competitive bids were solicited by the Post Office on August 2, 1930, and opened August 25. A surprise competitive bidding struggle ensued between UATC, through a quickly formed skeleton company it called "United Aviation," and the newly merged Transcontinental and Western Air over the central transcontinental route. After initial rejection of the Postmaster General's decision, final approval of the contract award to T&WA was approved by Comptroller General of the United States John R. McCarl on January 10, 1931, on the basis that United's puppet concern was not a "responsible bidder" by the definition of McNary-Watres, in effect validating Brown's restructuring. These three carriers later evolved into United Airlines (the northern airmail route, CAMs 17 and 18), Trans World Airlines (the mid-United States route, CAM 34) and American Airlines (the southern route, CAM 33). [n 2] Brown also extended the southern route to the West Coast. He awarded bonuses for carrying more passengers and purchasing multi-engined aircraft equipped with radios and navigation aids. By the end of 1932 the airline industry was the one sector of the economy experiencing steady growth and profitability, described by one historian as "Depression-proof." Passenger miles, the numbers of passengers, and new airline employees had all tripled over 1929. Airmail itself, despite its image to many Americans as a frivolous luxury for the few remaining affluent, had doubled following restructuring. Much of this if not all was the result of the postal subsidies, funded by taxpayers. Lewis' investigation began to develop into an air mail contract scandal. Lewis was having difficulty impressing his findings on government officials until he approached Alabama Senator Hugo Black. Black was the chairman of a special committee established to investigate ocean mail contracts awarded by the federal government to the merchant marine. Interstate Commerce Commission investigators seized records from all the mail carriers on September 28, 1933,[n 5] and brought about public awareness of what became known as "the Black Committee". [n 6] The special Senate committee investigated alleged improprieties and gaming of the rate structure, such as carriers padlocking individual pieces of mail to increase weight. Despite showings that Brown's administration of the air mail had increased the efficiency of the service and lowered its costs from $1.10 to $0.54 per mile, and the obvious partisan politics involved in investigating what appeared to be a Republican scandal involving Herbert Hoover by a Democratic-controlled committee, the hearings raised serious questions regarding its legality and ethics. Disregarding as Black did the fact that all but two of the existing contracts (the controversial transcontinental mail routes CAM 33 and CAM 34) had been awarded to the low bidder by Postmaster General Harry S. New during the Coolidge Administration, on February 7, 1934, Roosevelt's postmaster general, James A. Farley, announced that he and President Roosevelt were committed to protecting the public interest and that as a result of the investigation, President Roosevelt had ordered the cancellation of all domestic air mail contracts. However, not stated to the public was that the decision had overridden Farley's recommendation that it be delayed until June 1, by which time new bids could have been received and processed for continued civilian mail transport. Without consulting either Army Chief of Staff Douglas MacArthur or Chief of the Air Corps Major General Benjamin Foulois, Secretary of War George H. Dern at a cabinet meeting on the morning of February 9, 1934, assured President Roosevelt that the Air Corps could deliver the mail. That same morning, shortly after conclusion of the cabinet meeting, second assistant postmaster general Harllee Branch called Foulois to his office. A conference between members of the Air Corps, the Post Office, and the Aeronautics Branch of the Commerce Department ensued in which Foulois, asked if the Air Corps could deliver the mail in winter, casually assured Branch that the Air Corps could be ready in a week or ten days. In actuality, of the 262 pilots eventually used, 140 were Reserve junior officers with less than two years flying experience. Most were second lieutenants and only one held a rank higher than first lieutenant. [n 9] The Air Corps had made a decision not to draw from its training schools, where most of its experienced pilots were assigned. Only 48 of those selected had logged at least 25 hours of flight time in bad weather, only 31 had 50 hours or more of night flying, and only 2 had 50 hours of instrument time. Regarding equipment, the Air Corps had in its inventory 274 Directional gyros and 460 Artificial horizons, but very few of these were mounted in aircraft. It possessed 172 radio transceivers, almost all with a range of 30 miles (48 km) or less. Foulois eventually ordered the available equipment to be installed in the 122 aircraft assigned to the task, but the instruments were not readily available and Air Corps mechanics unfamiliar with the equipment sometimes installed them incorrectly or without regard for standardization of cockpit layout. The project, termed AACMO (Army Air Corps Mail Operation), was placed under the supervision of Brigadier General Oscar Westover, assistant chief of the Air Corps. He created three geographic zones and appointed Lieutenant Colonel Henry H. Arnold to command the Western Zone, Lieutenant Colonel Horace M. Hickam the Central Zone, and Major Byron Q. Jones[n 10] the Eastern Zone. Personnel and planes were immediately deployed, but problems began immediately with a lack of proper facilities (and in some instances, no facilities at all) for maintenance of aircraft and quartering of enlisted men, and a failure of tools to arrive where needed. Sixty Air Corps pilots took oaths as postal employees in preparation for the service and began training. On February 16, three pilots on familiarization flights were killed in crashes attributed to bad weather. [n 11] This presaged some of the worst and most persistent late winter weather in history. Further attention was drawn to the startup when the airlines delivered a "parting shot" in the form of a publicity stunt to remind the public of its efficiency in mail service. World War I legend Eddie Rickenbacker, a vice president of North American Aviation (Eastern Air Transport's parent holding company) and Jack Frye of Transcontinental and Western Air, both of which had lost their mail contracts, flew T&WA's prototype Douglas DC-1 airliner "City of Los Angeles," which was still in flight test, across the country on the last evening before the Air Corps operation began. Carrying a partial load of mail and a passenger list of airlines officials and news reporters, they flew from Douglas Aviation's plant at Burbank, California, to Newark, New Jersey. Bypassing several regular stops to stay ahead of a blizzard, the stunt established a new cross-country time record of just over 13 hours, breaking the old record by more than five hours. The DC-1 arrived on the morning of February 19 only two hours before the Air Corps was forced by the winter weather to cancel the startup of AACMO. On February 19, the blizzard disrupted the initial day's operations east of the Rocky Mountains, where the scheduled first flight of the operation from Newark was cancelled. AACMO's actual first effort left from Kansas City, Missouri, carrying 39 pounds of mail to St. Louis. Kenneth Werrell noted of the first flight out of Cleveland: "The pilot on the first air mail flight needed three tries and three aircraft to get aloft. Ten minutes later, he returned with a failed gyro compass and cockpit lights, and obtained a flashlight to read the instruments." Snow, rain, fog, and turbulent winds hampered flying operations for the remainder of the month over much of the United States. The route from Cleveland to Newark over the Allegheny Mountains was dubbed "Hell's Stretch" by airmail pilots. President Roosevelt, publicly embarrassed, ordered a meeting with Foulois that resulted in a reduction of routes and schedules (which were already only 60% of that flown by the airlines), and strict flight safety rules. Among the new rules were restrictions on night flying: forbidding pilots with less than two years' experience from being scheduled except under clear conditions, prohibiting takeoffs in inclement weather, and requiring fully functional instruments and radio to continue on in poor conditions. Control officers on the ground were made responsible for enforcement of the restrictions in their areas. On March 10, President Roosevelt called Foulois and Army Chief of Staff General Douglas MacArthur to the White House, asking them to fly only in completely safe conditions. Foulois replied that to ensure complete safety the Air Corps would have to end the flights, and Roosevelt suspended airmail service on March 11, 1934. Foulois wrote in his autobiography that he and MacArthur incurred "the worst tongue-lashing I ever received in all my military service". Norman E. Borden, in Air Mail Emergency of 1934, wrote: "To lessen the attacks on Roosevelt and Farley, Democratic leaders in both houses of Congress and Post Office officials placed the blame for all that had gone wrong on the shoulders of Foulois." Other supporters of the president outside of the government muted criticism of the administration by focusing on and excoriating Lindbergh, who had also made headlines by publicly protesting the cancellation of the contracts two days after they were announced, "as if his telegram had caused the deaths." Despite an 11th fatality from a training crash in Wyoming on March 17,[n 16] the Army resumed the program again on March 19, 1934, in better weather, using only nine routes,[n 17] limited schedules, and hurried improvements in instrument flying. [n 18] The O-38E, which had been involved in two fatal accidents at Cheyenne, Wyoming, was withdrawn completely from the operation despite its enclosed cockpit because of its propensity to go into an unrecoverable spin in the mountainous terrain. [n 19] In early April the Air Corps removed all pilots with less than two years' experience from the operation. By May 17 all but one mail route, CAM 9 (Chicago to Fargo, North Dakota[n 23]), had been restored to civil carriers. AACMO relinquished this last route on June 1, 1934. In 78 days of operations and over 13,000 hours of logged flight time, completing 65.8 percent of their scheduled flights, the Army Air Corps moved 777,389 pounds of mail over 1,590,155 miles (2,559,106 km). Aircraft employed in carrying the mail were the Curtiss B-2 Condor, Keystone B-4, Keystone B-6, Douglas Y1B-7 and YB-10 bombers; the Boeing P-12 and P-6E fighters; the Curtiss A-12 Shrike; Bellanca C-27C transport; and the Thomas-Morse O-19, Douglas O-25C, O-39, and two models of Douglas O-38 observation aircraft. The government had little choice but to return service to the commercial airlines, but did so with several new conditions. The Air Mail Act of June 12, 1934, drafted at the height of the crisis by Black (and known as the "Black-McKellar bill"), restored competitive bidding, closely regulated airmail labor operations,[n 28] dissolved the holding companies that brought together airlines and aircraft manufacturers, and prevented companies that held the old contracts from obtaining new ones. The new rules were put into effect in March before formal passage of the bill with the announcement that temporary contracts for up to a year would be awarded by Farley. The industry's response, with the tacit consent of the government, was simply to reorganize and change names; for example, Northwest Airways became Northwest Airlines and Eastern Air Transport became Eastern Air Lines. The vertically integrated United Aircraft and Transport Corporation (UATC) appeared to be its particular target and broke up on September 26, 1934, into three companies: United Air Lines Transportation Company, United Aircraft Manufacturing Company,[n 29] and Boeing Aircraft Company. The most punitive measure was to ban all former airline executives alleged to have colluded from further contracts or working for airlines that obtained one. United Airlines' president, Philip G. Johnson, chose to leave the United States and helped to form Trans-Canada Airlines. At the age of 52 William Boeing took early retirement as UATC's chairman of the board on September 18 rather than ever deal again with the federal government. Colonel Paul Henderson was compelled to leave his position as National Air Transport's general manager because he had attended the "spoils conferences," this despite offering damaging testimony against Brown to the Black Committee. The effect of the entire scandal was to guarantee that mail-carrying contracts remained unprofitable, and pushed the entire industry towards carrying passengers, which had been Brown's original goal as incentive for developing new technologies, increasing safety, and growth of the American aircraft manufacturing industry. Throughout the Black Committee process and a smaller, parallel investigation by the Justice Department directed by special prosecutor Carl. L. Ristine, the allegations of corruption by Lewis and Black were never investigated. The original air mail contracts were instead voided on the basis that they were illegally bid, without revealing what evidence was gathered on which that judgment was made and disregarding that most were obtained by the lowest bidder with the rest through statutory provisions of the Air Mail Act of 1930. The Air Mail Act of 1934 repealed those provisions but, with one exception, the carriers charged with illegally securing contracts under them were permitted to reacquire them despite provisions in the new act forbidding it. With bidding for contracts more competitive and air mail revenue less attractive than before, the airlines placed a new emphasis on passenger transportation and development of modern airliners. Several sued the government for revenues missed while the Air Corps flew the mail. The Black-McKellar bill sought to marginalize the suits by prohibiting the government from doing business with any carrier that filed them, but after severe criticism the provision was dropped from the bill. On February 4, 1935, almost a year after the contracts were cancelled, the District of Columbia Court of Appeals ruled that the cancellations "amounted to a breach of contract" and a taking of property without due process. The suits went forward, with the last claim settled in 1942. On July 14, 1941, Commissioner Richard H. Akers of the United States Court of Claims found that there had not been any fraud or collusion in the awarding of contracts pursuant to the Air Mail Act of 1930. Roosevelt also appointed Clark Howell, newspaper editor of the Atlanta Constitution, to chair a five-person committee to investigate all aspects of U.S. civil aviation, resulting in the creation of the Federal Aviation Commission. In severe economic distress, the airlines organized themselves in 1936 into the Air Transport Association of America. Two years later Black-McKellar went the way of McNary-Watres with the passage of the Civil Aeronautics Act, restructuring the airline industry to stress the features championed by Brown in 1930: "government-corporate linkages, limited competition, and restricted entry to the industry." The Air Line Pilots Association, a union that had publicly supported Roosevelt during the cancellation of the air mail contracts, offered a verdict on the scandal in its history of the union: "The small operators denounced the bidding session of 1930 as a 'spoils conference.' Actually, it was no such thing ... Admittedly, there was an element of ruthlessness in the way (Brown) proceeded, but it was not illegal. Brown succeeded in creating the genesis of a regulated, integrated airline system—a system that FDR would eventually copy. The union of airline pilots was in complete agreement with the policies of Hoover and Brown." The immediate results of the operation were disastrous for the image of the Air Corps. Speaker of the House Henry T. Rainey, echoing comments made by Gen. Billy Mitchell, criticized: "If we are unfortunate enough to be drawn into another war, the Air Corps wouldn’t amount to much. If it is not equal to carrying the mail, I would like to know what it would do in carrying bombs. "[n 36] Despite the public humiliation, the Air Mail Fiasco resulted in a number of improvements for the Air Corps, bringing about changes that its previous publicity campaigns were unable to obtain. Not surprisingly, the Baker Board endorsed the earlier findings of the Drum Board, supporting the status quo that the Air Corps was an auxiliary force of the Army and opposing the Air Corps becoming a separate service equal to the Army and Navy. It rejected the threat of air attack as a major threat to the national defense or the need of a large air force to defend against it. It opposed any expansion of the Air Corps until the needs of the Army as a whole had been addressed. [n 40] It did however reiterate the Drum Board's recommendation for the immediate activation of the GHQ Air Force, placing under it all air combat units within the continental United States. [n 41] This provided another, limited step toward an autonomous air force, but also kept authority divided by maintaining control of supply, doctrine, training and recruitment under the Chief of the Air Corps, and airfields in the control of corps area commanders. Within the Air Corps itself, instrument training was upgraded, radio communications were greatly improved into a nationwide system that included navigation aids, and budget appropriations were increased. The Air Corps acquired the first six Link Trainer flight simulators of a fleet that would ultimately number more than 10,000. The operation also demonstrated the complete obsolescence of open-cockpit aircraft in military operations, leading to increased development of modern types in the second half of the decade, most of which served successfully in World War II. Among the fallout of the scandal was the retirement under fire of Foulois as Chief of the Air Corps. He had been called to testify before the Rogers subcommittee on aviation of the House Committee of Military Affairs during the scandal. Chairman William N. Rogers of New Hampshire was suspicious of Foulois for negotiating aircraft contracts instead of assigning them to the lowest bidder, and during his testimony the Chief of Air Corps had been flamboyant and careless with hyperbole. In the wake of the mail fiasco, Rogers charged him with several violations of law and ethics, including making misleading statements to Congress and mismanagement during the air mail operation. Foulois demanded that Rogers release the evidence against him (largely damning testimony from senior Army staff officers given during secret hearings) and garnered the full support of the normally hostile Secretary of War, George Dern. The matter finally went before the Army's inspector general, whose findings in June 1935 exonerated Foulois of any criminal wrongdoing but did cite him for making misleading statements regarding the mail operation. He received a reprimand from Dern but throughout the summer of 1935 was publicly excoriated by Rogers. With his term as Chief expiring in December 1935, he chose to retire concurrently and took terminal leave from the Air Corps beginning in September. ^ The August 1930 bid was jointly awarded to the Southwest Air Fast Express, or SAFE Way, owned by Erle P. Halliburton, and Robertson Aircraft Corporation, like American a subsidiary of the Avco holding company. SAFE Way was acquired by American at a premium price on August 23, 1930, two days before the bids were opened, and both lines were reorganized by American as Southern Air Fast Express. ^ Brown testified to the Black Committee that the CAM 25 decision was based on Eastern's scheduling the entire route to Miami, Florida, while Ludington planned to use only the New York-Washington leg. ^ The committee was officially "The Special Committee to Investigate Air-Mail and Ocean-Mail Contracts, United States Senate, 73rd Congress, 2nd Session". ^ Congress enacted legislation on March 27, 1934 (48 Stat. 508) effective for one year and authorizing the Postmaster General to fund the operation from his appropriations, providing benefits to Army personnel killed or injured during the operation, and including Reserve officers called up for the operation as active duty members retroactive to February 10, 1934. ^ Major Charles B. Oldfield, a regional commander in the Western Zone. ^ Jones had joined the Aviation Section, U.S. Signal Corps in 1914 but was becoming disenchanted with the Air Corps. In 1939 he would transfer back to the Cavalry. ^ 2nd Lts Jean D. Grenier and Edwin D. White crashed their A-12 into Weber Canyon, Utah, and 1st Lt. James Y. Eastham crashed short of the runway at Jerome, Idaho, in a Douglas Y1B-7 bomber. ^ Major Oldfield was one of the two pilots, at Cheyenne on April 23. Despite the accident, the next year he was promoted to lieutenant colonel and assigned command of the 2nd Bomb Group. ^ 2nd Lt. Durwood O. Lowry died in Ohio, 2nd Lt. Fred I. Patrick in Texas, and 2nd Lt. George P. McDermott in New York. ^ Lindbergh was a salaried consultant and stockholder to both TWA and Pan American Airways. His telegram to Dern was made public by Newsweek Magazine. Sources: Tate 1998, p. 133 ("legalized murder"), p. 144 (Lindbergh), p. 155 (Newsweek). ^ 2nd Lt. Harold G. Richardson died when his O-38E spun in at low altitude. A recent co-pilot with United Airlines, Richardson was a Reservist called to active duty after being laid-off because of the mail contracts cancellations. ^ These routes were Chicago-New York, Chicago-San Francisco, Chicago-Dallas, Salt Lake City-San Diego, Salt Lake City-Seattle, Cheyenne-Denver, New York-Boston, New York-Atlanta, and Atlanta-Jacksonville. ^ The O-38E was not designed to carry extra equipment or loads, and so used its small baggage compartment and rear cockpit to transport mail. The aircraft was difficult to hold level at higher altitude, causing it to whipstall (an unintentional tailslide), and the improperly distributed weight quickly brought about a spin that needed a minimum of 2000 feet to recover. ^ This route had been last operated by Northwest Airways, Lewis H. Brittin's company. When the three-month temporary contract was awarded, it again went to Northwest, now doing business as Northwest Airlines. ^ In addition to the 12 deaths commonly listed, Dr. Kenneth P. Werrell documents a 13th on April 5th, which was reported by the Associated Press on April 6 as the "thirteenth mail flyer to die." That is further substantiated by a claim made by the pilot's parents for the "death gratuity" of $500 awarded to families of Reserve officers killed flying the mail, which was awarded by Congress on May 15, 1935. ^ Those of Lowry, Howard and Kerwin, Weineke, and Wood. ^ The rate of deaths per 100,000 hours of flight also rose from 11 to 14, an increase of 28%. Werrell also notes that 1934 was a particularly bad year for aviation safety in general, as civil aviation also had more deaths and a higher fatality rate in comparison to 1933 and 1935. ^ UAMC was a consortium of manufacturers including Pratt & Whitney, Vought, Sikorsky, and Hamilton Standard, and is now United Technologies. ^ Post Office Solicitor and Fort Worth attorney Karl Crowley held that United's presence at the conference was sufficient evidence of guilt and denied it a hearing to present its case. (Van der Linden, p. 285). ^ These bills were H.R. 7601 and 7872, committee hearings for which were underway during AACMO. ^ The three were Foulois, Gorrell and Doolittle. Gorrell wrote the history of Air Service operations in World War I and was the first important advocate of strategic bombing. As a result of his participation on the Baker Board he was asked the following year to head the new Air Transport Association of America, the major trade association for the airline industry. Baker and Compton were named to the board because they were ostensibly "associated with the development of aviation," but primarily to offset Lindbergh's refusal to serve, which was a black eye to both the Administration and the War Department. ^ Doolittle alone opposed the findings of the report, although Foulois later stated that he wished he had joined Doolittle, who filed a minority report recommending an Air Corps with a separate budget, promotion list, and its own staff separate from the General Staff. ^ The Drum Board had done so to enable plugging Air Corps elements into its various "color" war plans, particularly Red-Orange (a coalition of Great Britain and Japan, viewed by the Army as a "worst-case scenario"). GHQ Air Force was a feasible if "risky" means of doing so without expanding the existing Air Corps. It also had the benefit of countering a bill to increase the size of Naval Aviation that had passed the House by proposing all future increases maintain an 18 to 10 ratio in numbers of aircraft favoring the Army. ^ "The Airmail Act of 1930". AvStop.com. Retrieved 17 January 2017. ^ a b c d e f g h i j k l m n o p Correll, John T. (2008). "The Air Mail Fiasco" (PDF). AIR FORCE Magazine. Retrieved January 3, 2015. ^ a b c d "Air Mail and the Growth of the airlines". US Centenniel of Flight. Archived from the original on October 7, 2012. Retrieved March 10, 2008. ^ Tate (1998), p. 132. ^ Maurer (1987), p. 301. ^ a b c d Frisbee, John L. (1995). "AACMO: Fiasco or Victory?". AIR FORCE Magazine. Retrieved January 3, 2015. ^ Nalty (1997), p. 123. ^ Coffey (1982), p. 153. ^ a b Nalty (1997), p. 122. ^ a b c d e Werrell, Kenneth P. "'Fiasco' revisited: the Air Corps & the 1934 air mail episode". Air Power History, March 22, 2010. Reproduced by The Free Library, thefreelibary.com. Retrieved 2016-01-03. ^ a b c Virginia Van Der Veer Hamilton (August 1974). "Barnstorming the U.S. Mail". American Heritage magazine. Archived from the original on January 7, 2009. Retrieved April 27, 2009. ^ Maurer (1987), p. 315. ^ Coffey (1982), p. 154. ^ Congressional Record, 73rd Congress, 2nd Session, Vol. 78, Pt. 3, 3144–3145. ^ McNalty (1997), p. 126. ^ Tate (1998), pp. 145–146. ^ Tate (1998), P. 139-141. ^ Tate (1998), p. 150. ^ McNalty (1997), p. 125. Serling, Robert J., (1976). "The Only Way To Fly". Doubleday & Company, Garden City, New York. ISBN 0-385-01342-6. Shiner, John F. (1983). Foulois and the Army Air Corps 1931-1935, USAF Office of Air Force History, Washington, D.C.
Tate, Dr. James P. (1998). The Army and Its Air Corps: Army Policy Towards Aviation, 1919–1941, Air University Press, Maxwell AFB, Alabama. Zuckerman, Michael A. "The Court of Congressional Contempt", Journal of Law and Politics, Winter 2009, reproduced by The Wall Street Journal Law Blog. Retrieved 2016-01-08.